Champs Sports has just announced that they will be debuting another exclusive adidas NMD beginning tomorrow, August 3rd. 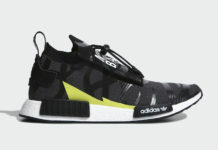 Dubbed, the “Black Reflective” this adidas NMD will join the other NMD R1 and EQT ADV in “Chalk and Olive” also available tomorrow. Highlighted with 3M Reflective detailing that appears on the laces, side stripes and logo on the tongues, along with Grey color blocks. Look for the adidas NMD Rollerknit “Black Reflective” to release exclusively at Champs Sports tomorrow, August 3rd. The retail price tag is set at $130 USD.